Leaders - whether in business, government or the non-profit sector - take risks but often without fully understanding risk at a strategic level. Expanding upon the well-known "ESG" risks, this book explains the key non-financial (environmental, social, governance and technological, or ESGT) risks. For many leaders (including board members) taking risk without knowledge or preparation can lead to organizational crisis, scandal and value destruction. For those who are prepared, resilience follows and so does the ability to transform ESGT risk into opportunity and value for stakeholders. Gloom to Boom is a book for everyone - from the highest levels of leadership in an organization (the board, CEO and c-suite), to other senior leaders (the chief risk officer, CFO, general counsel, head of CSR and sustainability, CISO, CHRO), and midlevel leaders, students and folks simply interested in current affairs and the role and impact of strategic risk and opportunity on their lives. "A book as impressive in its breadth of content as its optimism, Bonime-Blanc offers compelling analysis of the most pressing issues of the day, pairing them with concrete strategies that a wide variety of organizations are capable of adopting. For those in the field, a book not to be missed." Ian Bremmer, President, Eurasia Group, New York, USA. "While any risk event calls first for an immediate response of a technical and tactical nature, Andrea underscores the criticality for leaders to take a step back, reflect more broadly on how such risk event could change the trajectory of the enterprise, and ultimately test the validity of their business strategy going forward. The fact that Andrea covers so much material will give the readers the opportunity to pick and choose case studies, lessons learned, and compelling stories based on the specific circumstances they are facing at any given time – and to improve their ability to see both the specifics of a risk event and the opportunities it might open up in terms of value creation for the enterprise." Amedee Provoust, Director – Operational Risk, The World Bank, Washington DC, USA. "Andrea Bonime-Blanc´s must-read primer provides a solid conceptual framework with strongly documented case studies to help business leaders detect, administer and mitigate non-financial risks and, then, to turn them into strategic growth opportunities. One of its most novel contributions is the incorporation of the "T" into the ESG equation in light of the increasing challenges posed by the current technological revolution. It is a must-read for investors, both individual and institutional, who ought to embark in a risk due diligence process to decide whether or not to invest in a company. The examples described in the book – including those of Equifax, Volkswagen and Wells Fargo, among many others - showcase the negative financial and reputational consequences of not doing so. Also, the description of how Microsoft and Salesforce have addressed their respective ESGT challenges demonstrate the positive impact that ethical leadership, transparency and setting the right tone from the top have on corporate culture." "In Gloom to Boom Andrea Bonime-Blanc has managed the seemingly impossible: How to take difficult, complex concepts, explain them in ways that everyone can understand them, and chart an actionable path for businesses to follow and thrive. Andrea does this in a natural, systematic way, a way that intuitively makes sense and compels the reader to follow-on. Her "Ten Megatrends of our Turbulent Times" is absolutely essential reading, and it creates a foundation on which Andrea builds a compelling narrative for transformation. Andrea’s chapter on Leadership reflects her direct, no-nonsense, "get it done" style, and provides any board member with an irreplaceable diagnostic resource as they navigate these turbulent times. Finally, her thorough treatment of "Environment," "Society," "Governance," and "Technology" is masterful in both scope and presentation. Andrea deals with each of these with the necessary level of detail, plenty of examples and supporting material which enable the reader to understand, master, and finally translate, shape, and fit this information into action for their specific company. Andrea brings all this together in the final section of her book, aptly named "Boom" where she demonstrates how business leaders, using the concepts presented, can achieve resilience and deliver sustainable value. I couldn’t put this book down! I consider this book required reading for any investor, board member, executives across industries, government, non-profits and academia." Chris Moschovitis, CEO, tmg-emedia and author of Cybersecurity Program Development for Business, USA. "Aristotelian in its scope, Dr. Andrea Bonime-Blanc’s latest book Gloom to Boom is an encyclopedic journey through the metaphysics of risk. The key questions, what’s there and what’s it like, pop into relief with ontological brevity: ESGT—environmental, social, governance and technology. These are not the classical operational perils that risk professionals and insurers spent generations learning how to measure, manage, and hedge. Rather, they are the risks of what Dr. Bonime-Blanc calls strategic megatrends—environmental changes from humans' interaction with their planet, social changes from climate changes of the cultural kind, governance changes from evolving notions of business roles and responsibilities in society, and technological changes that are transforming basically everything. One can find today many books on risk management, and others on the themes of ESGT. But for a global view of ESGT and risk with an eye towards strategy that leaders can deploy to navigate expertly through myriad risks to find opportunities, one need search no further than Gloom to Boom." Nir Kossovsky, MD. CEO, Steel City Re and author of Reputation Stock Price and You, USA. "Gloom to Bloom: How Leaders Transform Risk into Resilience and Value is an extraordinary and comprehensive treatise regarding the chaos and disruption we are currently experiencing. In addition to discussing and dissecting in enormous detail the very issues causing such great uncertainty, Dr. Bonime-Blanc offers extremely practical solutions – indeed, a clarion call to action – to transform risk into resilience and action, while achieving value. Other features of this monumental undertaking are the numerous, very current, and practical case study examples, making this book a real resource for practitioners. Each chapter draws upon significant sources and resources, adding to the value of this book as a truly useful reflection on how we can survive and thrive in today’s world." Keith T. Darcy, President, Darcy Partners, Former Executive Director Ethics & Compliance Officer Association (ECOA), Member of the Faculty of The Wharton School, New York, USA. 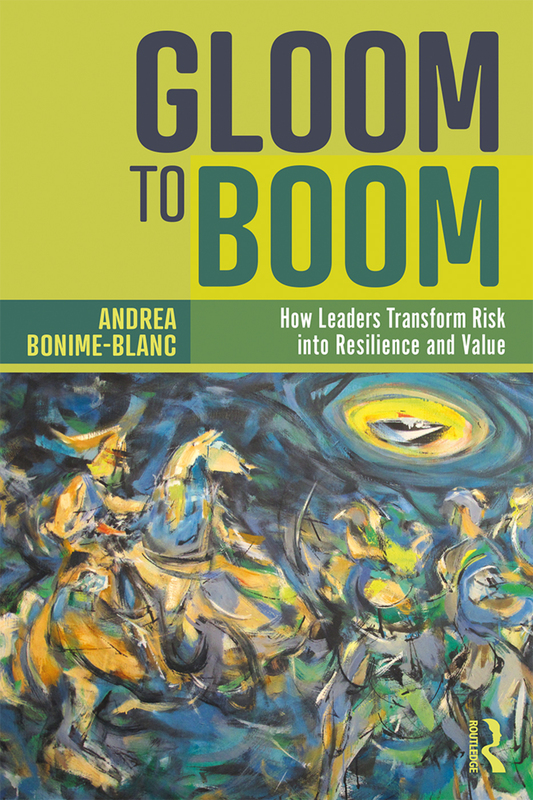 "In Gloom to Boom, Dr. Andrea Bonime-Blanc, one of the most formidable minds on ethical leadership and corporate governance, lays out a powerful and practical case for how leaders can flip the script on risk, adverse market forces and disruption, while charting a course for long-term prosperity and ESG equilibrium. All too often books about risk and governance are cliffhangers. Heavy on the doom and gloom and light on practicality. Dr. Bonime-Blanc corrects this trend and pours her years of board, legal, ethical and governance experiences in this rich and essential work." Dante Alighieri Disparate, Chairman CEO, Risk Cooperative. Washington DC. USA. "Drawing on personal experience and professional observation, Dr Bonime-Blanc has produced a thought-provoking call to action that deserves to find a place in the briefcase or on the bedside table of every C-Suite executive. At a time when political, economic and social norms are being stressed to the breaking point, she offers calm analysis and reasoned solutions. This book is both prescriptive and ground-breaking. I highly recommend it." "Taking up where she left off with The Reputation Risk Handbook, Dr Bonime-Blanc provides a practical guide for all types of leaders on strategic environmental, social, governance and technological issues that are both risks and opportunities. In a world of turbulence and chaos, she arms executives with a positive and actionable roadmap to resilience and value protection and creation." "This book achieves its dual purpose: It is a practical guide and handbook for executives and an interesting read for academics. Dr Bonime-Blanc guides the reader through the risks and challenges of our increasingly complex world – combining an impressive "tour d’horizon" of today’s and tomorrow’s political and corporate risks with very "hands on" recommendations for how to survive and even transform these risks for the greater good. The book impressed me the most in its chapters on Leadership, Ethics & Compliance and Governance. The author not only delivers a sound description of the subject matter and best practices. With her personal experience as an executive, she has written a book with a very personal touch that adds value to what might otherwise be seen as abstract subject matter." Part II: Navigating through the Scylla and Charybdis of "ESGT"
Dr. Andrea Bonime-Blanc is a global strategic governance, risk, ethics and cyber advisor to business, government and non-profits, a board member, and former global executive. She is a published author, keynote speaker, Ethics Advisor to the Financial Oversight and Management Board for Puerto Rico, and start-up mentor at Plug & Play Tech Centre. She is faculty at NYU, IEB (Spain) and IAE (Argentina).